Musculoskeletal tissue injuries and degeneration are common and debilitating for a high number of patients (Brooks, 2006). Unfortunately, endogenous musculoskeletal tissue regeneration is limited in many cases and may be affected by inflammation and the degree of damage. For example, most fractures of long bones heal spontaneously, whereas large segmental defects fail to heal. Additionally, although articular cartilage has almost no intrinsic reparative potential, tendons and ligaments may heal, but often with inferior properties. 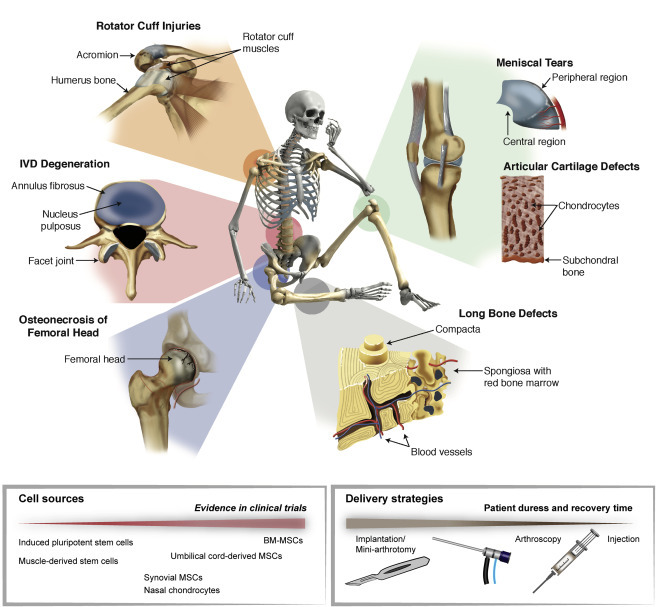 The high prevalence of these injuries has led to significant investment in the development of new therapies to enhance healing and augment current surgical interventions. Often the goal is to mimic and recapitulate the natural healing cascade and developmental process by transplantation of tissue-specific stromal and progenitor cells or by endogenous manipulation to enhance the native repair capacity of cells. There has been a continuing increase in the number and type of stem and stromal cells being pursued in human clinical trials for treatment of musculoskeletal injuries (Steinert et al., 2012). Most approaches in this area are based on ex vivo-expanded mesenchymal stromal cells (MSCs) derived from bone marrow (BM). Originally identified and characterized by their multilineage differentiation potential in vitro, multipotent capabilities of MSCs in vivo have not been clearly demonstrated to date, particularly because of the lack of methods to identify and define differentiated populations (Nombela-Arrieta et al., 2011). Central to recent progress in the field has been the understanding that stem and progenitor functions of MSCs may not be the key attribute that mediates tissue repair. In addition, there is outstanding controversy over the terminology of exogenously supplied MSCs as stromal cells, and various terms, including medicinal signaling cells, have been proposed to more accurately reflect their therapeutic function in vivo (Caplan, 2017). Nevertheless, the therapeutic benefit of these cells has been largely explored. Significant advances have been made in developing strategies that deliver, protect, and recruit stem cells, and the bioengineering field is evolving to improve current surgical techniques.